BLACK STAR RIDERS have parted ways with drummer Jimmy DeGrasso. The remaining members of the band wish him well in his future endeavours and thank him for the great albums, killer shows and good times together. The new BLACK STAR RIDERS drummer will be announced shortly. 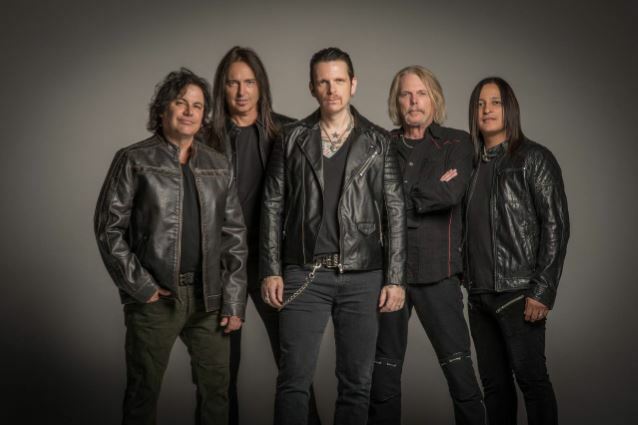 BLACK STAR RIDERS guitarist Damon Johnson recently told the "White Line Fever" podcast that DeGrasso's involvement in the RATT reunion would have no negative impact on their band. DeGrasso, 53, has performed with Stephen Pearcy, Warren DeMartini, Juan Croucier and Carlos Cavazo twice in recent months as the newly reactivated RATT prepares to tour. But DeGrasso also had a demanding schedule with trans-Atlantic rockers BLACK STAR RIDERS, who have just released their third album, "Heavy Fire". "Jimmy's such a world-class, amazing drummer that he's going to sound great in any situation," Johnson told "White Line Fever". "I just know, for all of us, we love to play. "I love meeting the guys who are involved in other stuff. There's no way that his participating in that is going to interfere with BLACK STAR RIDERS. "I think all the RATT guys are still trying to figure out what they're going to do anyway. "It's a great opportunity for Jimmy, and any time I talk to him about it, he just kind of laughs about the whole thing because it's crazy that he would be at this point in his life and his phone would be ringing all the time from all types of people that want to have him come and play. "So I'm happy for him and it's got to be a lot of fun." Asked if DeGrasso will once again sit behind the kit when Pearcy, Croucier, DeMartini and Cavazo resume playing shows as RATT, Stephen told "Trunk Nation", Eddie Trunk's show on SiriusXM channel Volume (106): "I think we're still figuring that out. You know, we're taking things a little differently nowadays. Everything has to be I's dotted, T's crossed. No disrespect to anybody, but we want things done properly, we want things done right to where there's some life left in this and we can walk away going, 'Hey, that was a really good run. Let's do it again in three years.' You know what I'm saying? So we wanna do everything very meticulously — just like the approach I took on [my new solo album] 'Smash'. I mean, look, we took our time until we couldn't do anything else to it. We didn't throw more icing on it to sweeten it up; we just said, 'Hey, it is what it is.' So the same approach is going to be schematic with how we approach RATT and our business — very carefully, very meticulously and very smart."